The Bakkery tried to do a little tobogganing the other day, and no less than three popular tobogganing hills were sporting these signs… seriously? 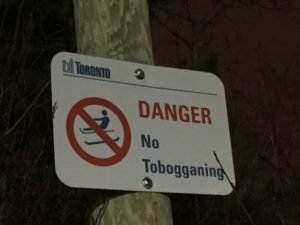 Toboganning is a basic human right! How can you deny us the joy of gravity? ITS NOT FAIR!… Anybody got a hill we can use?